Mark Brinsden joined the Royal Navy as a medical student and graduated from University College Hospital, London in 1993. After his pre-registration jobs he passed Royal Marines Commando training and joined 40 Commando Royal Marines as their medical officer. He deployed with the unit on operations in Northern Ireland, the Mediterranean, the Far East and South Africa. He undertook a basic surgical training rotation in Plymouth and gained experience in general and vascular surgery; plastic surgery; trauma and orthopaedics and ITU; and higher surgical training in trauma and orthopaedics with the Peninsula and Oxford deaneries. He passed the intercollegiate - FRCS(Tr&Orth) - examination in 2004 and received fellowship training in shoulder and elbow surgery at the Nuffield Orthopaedic Centre, Oxford; and fracture surgery at the John Radcliffe Hospital, Oxford. In 2005, he was appointed as a consultant trauma and orthopaedic surgeon in Plymouth. His clinical practice includes trauma surgery and any musculoskeltal condition affecting the shoulder and elbow. He is an FRCS(Tr&Orth) examiner for the Intercollegiate Specialty Examinations and a reviewer for two scientific journals. He is a callout member of the Dartmoor Search and Rescue Team Plymouth and enjoys all activities involving the outdoors. 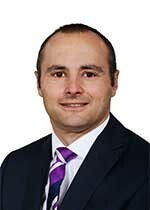 Mark Brinsden has been the Principal Investigator in five National Institute of Health Research trials and has published and presented nationally and internationally in the areas of shoulder and elbow surgery. Mr Mark Brinsden does not hold a share or financial interest in this hospital, another Nuffield Health hospital or the company. Mr Mark Brinsden does not have a share or financial interest in equipment used at this hospital or another Nuffield Health hospital. Mr Mark Brinsden does not hold any paid advisory role(s) at this hospital or on behalf of Nuffield Health.